The Bishops in this set are Priests on the Hunter side of the board, and Vampires on the Monster side. Two Vampires and two Priests are included in each set, and are approximately 3 ¾ inches in height. 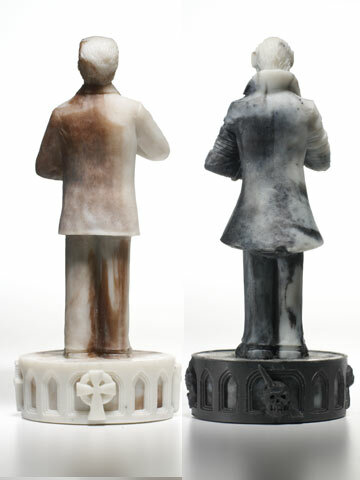 The bishops were actually sculpted a second time, and the original sculpts were thrown out. The body positioning of the new sculpts mirror each other wonderfully, even though one is holding a cross and Bible, and the other is contorted in a corpse-like pose. And this set is based on classic monster match-ups. So if you like your Vampires sweet and sparkly, or think they should be the 'good guys', you are out of luck. Please click on 'ROTATE' to view the bishops from all four sides.